We all lose track of where we left off with our projects from time to time. 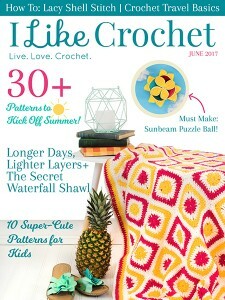 We live in a time where everything moves so fast and sometimes our crochet suffers for it. Things come up. We put our work down because our child needs something or the phone rings. It happens. I know it can be frustrating spending time trying to figure out what row or which stitch you should work next when you just want to sit down and start stitching. Worse, you might have to rip back your work to figure out where to start again. It’s certainly a pain, but don’t beat yourself up too much. However, it sounds like this is happening to you a lot. If you are constantly losing track of where you left off, maybe examine the reason or reasons behind it. Once you understand the why behind it, then you can tackle it and find a solution. So, why do you lose track? Do you get bored or frustrated with the project and just put it away? Do you think you’ll be right back but then you don’t get back to it for a day, a week, or longer? Or maybe you don’t have a tracking system in place for when you stop working on a project to note where you left off? Understanding what is behind why you lose track is key to taking steps to correct it. Build in regular scheduled breaks. I like this one because it’s a more proactive solution. You work to the end of the row or pattern repeat or a place in the pattern you choose, then take a break for a drink of water, rest your wrist, take the dog out, or check on the kids. This way you are staying healthy, staying ahead of family responsibilities, and can easily pick up where you left off when you have time to return. Make detailed notes. In this system, you make notes on the pattern or write out on a note-card what you did last and what to do next, then place it in your project bag with the yarn and hook. This can seem like a pain when you’re thinking you’ll be right back. 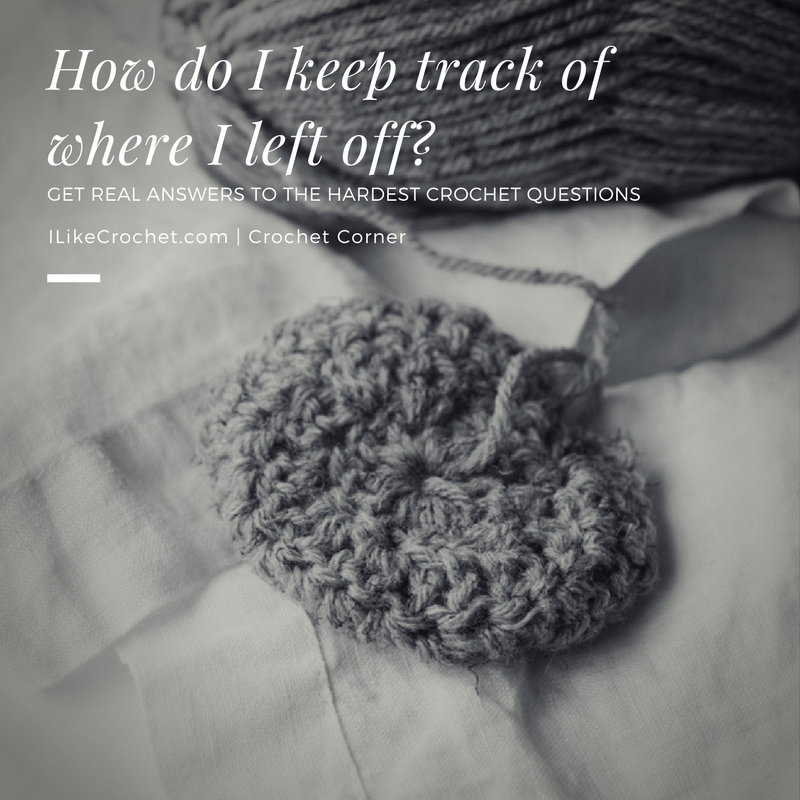 But the truth is, things happen to keep us away from our crocheting longer than we plan and this way there will be no confusion. Record a voice memo. I have so many things on my mind and on my to-do list that I find myself making a lot of voice memos on my phone. It’s a quick and easy way to tell your future self what you’ve done and what to go next. Use stitch markers. Get some pretty and fun stitch markers and pin at the beginning and end of pattern repeats. You’ll have some pretty crochet jewelry for your project as well as be able to have a point of reference in your pattern. Elizabeth, I know these are not new and radical ideas. However, the trick is to use them. You just need to pick something and stick with it. Regardless of the system you decide to use, just remember to be consistent and you’ll never lose track of where you left off again. What do you think of these suggestions? Which one would you use and why? Can you add any? I use strip magnet stuck to scrap booking paper and folded in half, pattern in the middle.It moves easily but stays secure in transit. Work around liquids? Use packing tape to cover paper first then stick to magnets. I use sticky notes to mark each line of the pattern,then write where I stopped and any info I might need. I use merchandise tags (with strings) and put the name of the pattern and hook size in ink. Then I use a pencil to record the last row/round completed. No matter how long I put the project away for, I know where to start in. I erase the penciled remarks and put in a new one when I put it down again. What app on your kindle? I found that when I learned how to “read” my work, it was much easier to tell where I should be in the pattern. And if I mark off each row as it is finished, I have very little trouble finding the exact place I should begin again. I have several projects at a time and don’t usually have a problem finding my place. These are all good ideas. I try always to take a break at the end of a row. Using a pencil I check mark that row so I know right where to pick up again, even if it’s a month before I pick it up again. during hot weather. I have used: super sticky Post-it notes; the magnetic board commonly sold in the cross stitching area; a large paperclip slid down the side margin of my pattern copy; a row counter for knitting / crocheting. Hope this is helpful. I also tick each line in pension as I go along. In cases where I need to make repeats e.g. 6 times I will draw llllll at the side of the row and tick off each repeat as I go along. For rounds its best to place stitch markers on the stitch where I am supposed to join later, e.g. A single crochet stitch instead of the first stitch of that row. I have an app on my kindle. I can leave notes as I wish. I titled ONE crochet. I generally have the pattern pasted too. I can leave all the notes I want plus mark where I am. Great for me I usually have 2 maybe 3 projects going at once. Helps from getting bored. A method I’ve used in the past – I place the pattern in a sheet protector and use a marker to highlight the row I have finished. A dry erase marker erases easily so that you can have clear access to the pattern from start to finish. I put my pattern in a sheet protector and mark my place with a dry erase pen. I will use color yarn to mark my spot.when I’m at the edge to ch and turn I will put a large loop in the yarn to keep it coming down quickly and remember to start on the next two.I try to finish a before I have put my project down. I like all the tips cause I am of those that start and stop a lot. Now when I’m doing a scarf I can go by the tail especially if its a cable stitch scarf if its on the right I know to confront posts and when the tail is on the left I known to back post. Then I can weave the tail in when I’m done. This is great. My family laughed at me for keeping detailed notes about where I was with a pattern. I am vindicated, thank you. I must admit that I’m terrible about taking breaks, I get engrossed in something and forget the time. This tip I will have to use. Thank you. When I use a pattern, I check off the rows in pencil as I finish each one. Although it means stopping, it takes such a short amount of time I don’t mind. If I stop for a longer time, I always know where I left off. If I stop in the middle of the row I can always tell exactly which row I am on and if I can’t see where a repeat is I can rip out to the previous row and still know where I am. Great article for me. I want to do the project start to finish at one time. Usually never happens. I like the scheduled break times. Making notes and always have to use stitch markers. Thanks for the ideas.